Arugula and Prosciutto di Parma on a pie are understandably a perfect pair, but this particular arugula prosciutto pizza is anything but ordinary. The mozzarella baked into the crust gives the pie a light, flaky texture that pairs perfectly with the arugula. This pizza is the right size as a personal pie or for sharing with guests as a delicious prosciutto appetizer. It is great to pair with a variety of wines but specifically a fruity Sangiovese, like a Chianti, brings out the flavors. Find out more about the perfect wine pairings for this pie. Cut half of the mozzarella into 1/2-inch cubes and place in a mixing bowl. Finely slice the remaining mozzarella and place it on a cutting board. Using the side of a chef’s knife, mash the cheese into a paste. Add it to the bowl of cubed mozzarella. Stir in the cream, buttermilk and Parmigiano cheese. Add salt and pepper, to taste. Stretch out the pizza dough to about 12 to 14-inches and place on a very lightly greased, large baking sheet. Spoon the cheese mixture onto the pizza, cover most of the dough but leave an edge. Sprinkle generously with freshly ground black pepper. Bake about 12 minutes or until crust is golden brown. 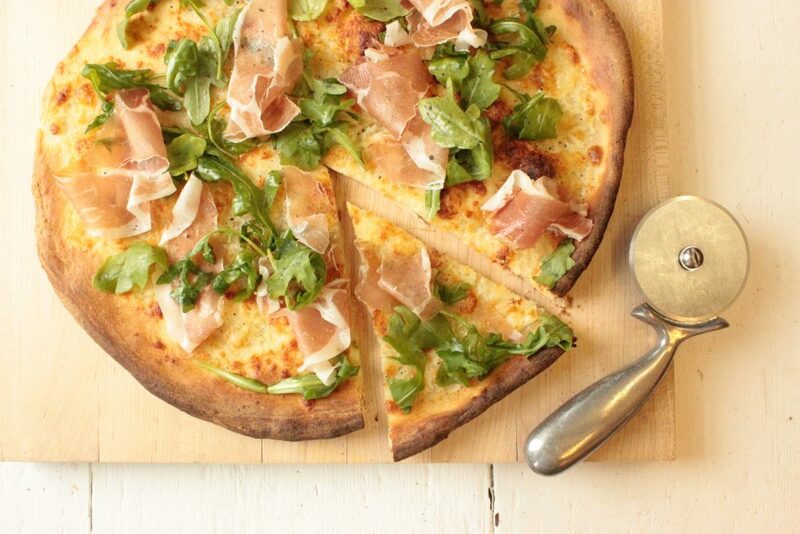 Top pizza with Prosciutto di Parma, arugula and a drizzle of oil.